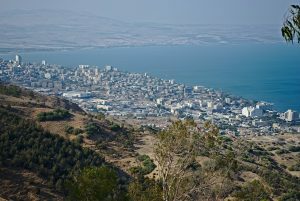 Tiberias as seen from the Switzerland Forest Road. Today, the waterfront of Tiberias is a little tacky in spite of the new construction of expensive high rises. We ignored all those little stands selling “authentic” Chinese merchandise and the overpriced tourist restaurants. Back in the days of the Roman Empire, Jesus did most of his teaching near the Sea of Galilee. In 135 CE, the Jews moved their cultural center to Tiberias because they were banished from Jerusalem as punishment for rebelling. The Sea of Galilee was a thriving and vibrant hub of civilization, activity and trade until the Byzantines lost control to an Arab Caliphate in the seventh century. We stayed in a very nice one bedroom apartment called Lakeside Kinneret View Apartment that we found on booking.com. 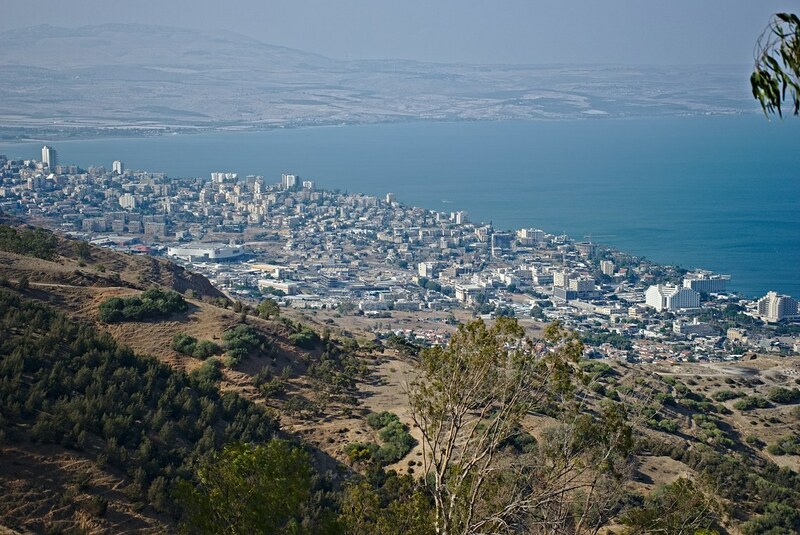 Kinneret is another name for the Sea of Galilee. We spent our time climbing the mountains, hiking the trails and fording the streams in the wonderful national parks all around the lake. The shaded trail of the Betiha Nature Reserve. One of the secrets of using booking.com is to search for a place with your login, but not book it. After an hour or two, they email you with better deals. We bought jumbo Medjool dates, fresh figs, whole wheat pita, goat cheese, olives and Tishbi merlot wine and found great spots to picnic. 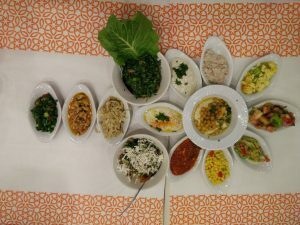 There is an excellent Arab restaurant, Tanureen, by the village Migdal a few kilometers north of Tiberias. We spent a long evening there, speaking Hebrew, Italian and English to many of the restaurant guests who we met. We needed many hours to even make a dent in the number of salad dishes served. In Israel, a lot of petrol stations on major roads have restaurants on their property and this was just another fine dining experience behind the gas pumps. View from the Arbel Cliffs National Park with the NW corner of the Sea of Galilee on the right. 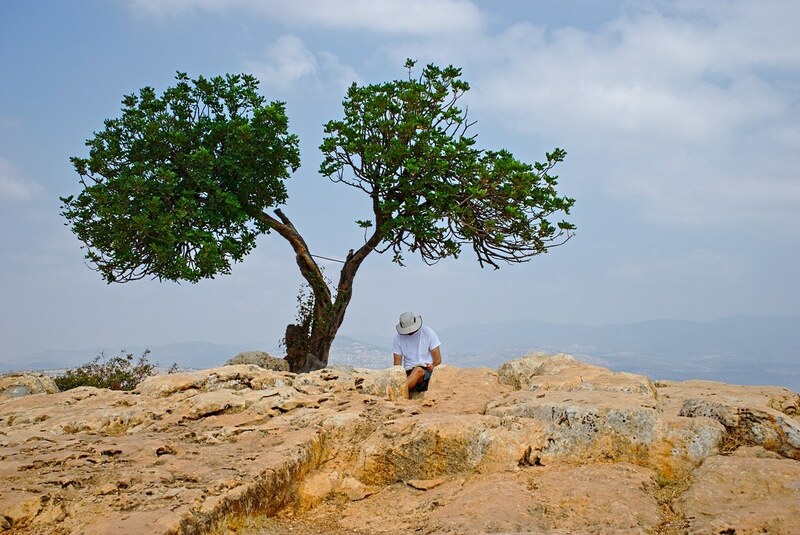 The cliffs of Arbel offer the most incredible views of the Sea of Galilee. 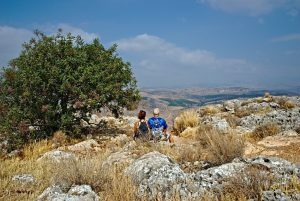 For a little extreme adventure, you can descend the cliffs by a path that coincides with both the Jesus Trail and the Israel National Trail (the trail that traverses the entire length of the country). The descent passes by 17th century cliff dwellings of the Druze. We decided to forego the extreme hike in the 100°F/38°C Israeli summer and save our aging knees for other parks. We met Justin reading scriptures on the Jesus Trail. 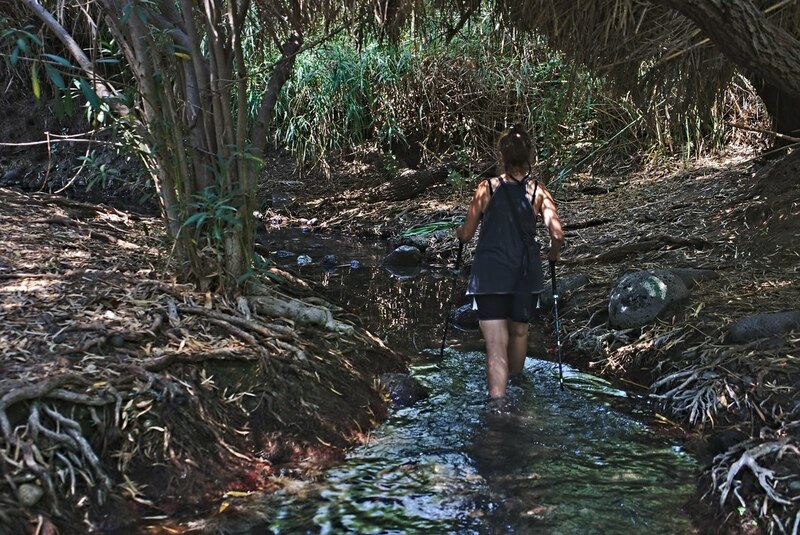 Rather than climbing down cliffs in the hot sun, how about a nice walk in a cool stream in the shade? That’s what we did in the Bet Tseida Forest. 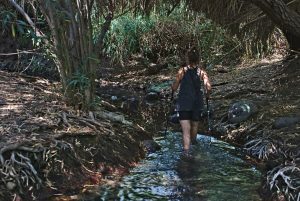 This National nature reserve has a trail through the Daliyot stream of cool, refreshing water up to your calves, or maybe thighs in some places depending on how tall you are. It’s a delightful way to spend an afternoon. 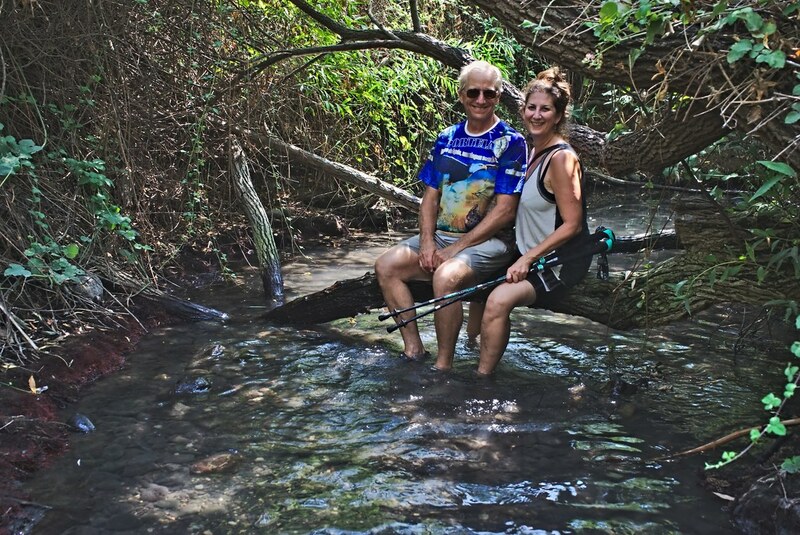 Relaxing in the Daliyot Stream. We drove clockwise around the lake and returned to Tiberias via the Switzerland Forest Scenic Road which, about half way, merges with the Israel National Trail. It has fantastic views of the southern part of the Sea of Galilee. The driver, however, has to keep his eye on the winding road. Same in life, right? About an hour drive south from Tiberias as we were on our way to Jerusalem, is another incredible place to spend a hot afternoon in the water. 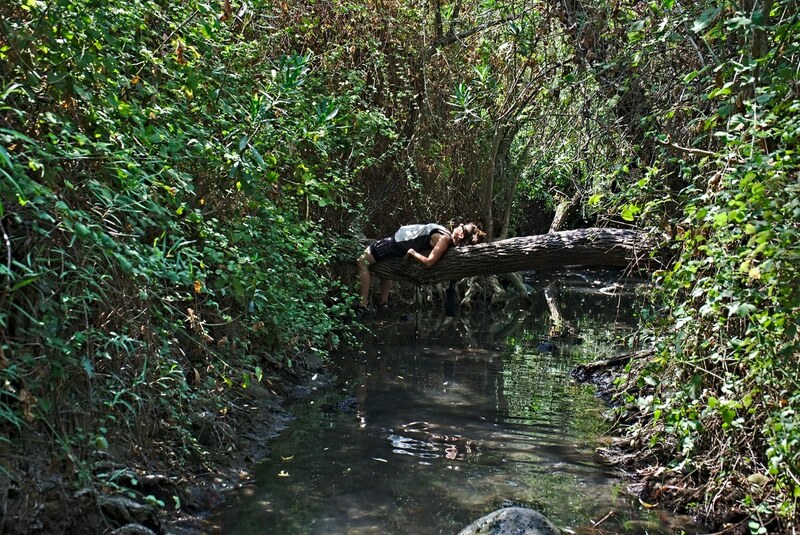 The Amal Stream is a warm water spring that keeps the swimming holes in this national park at a constant temperature. The developed park is a great place to spend the day if you bring your shade structure (or get there before anyone else to claim the shady spots!). There’s a foot cleaning station on each set of stairs leading into the water. It’s provided free by countless little fish. There is also an old water mill on site, a preferred location for those bathers who arrive early; and The Museum of Regional and Mediterranean Archaeology. 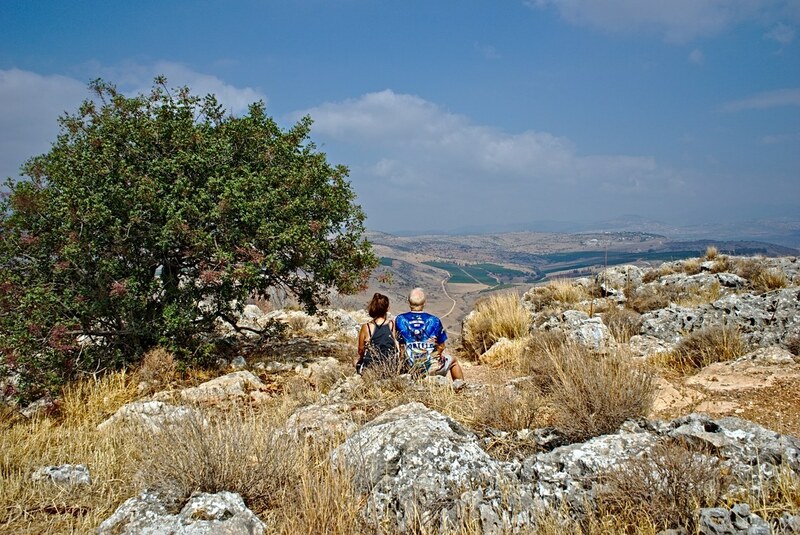 Travel Tip: The Israel National Parks Pass is well worth the money if you like trails. We figure that we broke even with just four parks. Justin reading scriptures on the Jesus Trail. Lovely post. Really enjoyed it.I visited Europe in the Spring (Transatlantic on Celebrity Reflection to Rome then to La Spezia, Torino, Lausanne, Bern, Basel, Stroudsburg, Luxembourg, Bacharach, Frankfurt, Berlin, Hamburg, Amsterdam & Reykjavik. Was a great 2 month trip. Going to Barcelona in October for Transatlantic back to NY then taking QM2 (great price) to Southampton & spending time in UK & Ireland before heading home to NY before Christmas. Always great to hear from you. Thanks for the comment, Cory. We’re returning to the Western Hemisphere in October too! We’ll spend the last few months of the year in Panama. We always have a good time in the UK but haven’t hit Ireland yet. 🙂 Thanks for sharing. Looking forward to the next post! Haha,, yes on the hat, and this one is a little more practical: UV blocking, light weight and crushes into the backpack! A man does not insist on physical beauty in a woman who builds up his morale. After a while he realizes that she *is* beautiful – he just hadn’t noticed at first.